‘Peace does not mean to be in a place where there is no noise, trouble or hard work. Illness and a change in health can raise a lot of issues for you and those close to you. Spiritual care is about having someone to listen and help you to cope with whatever you may be going through. The Pastoral Support Service offers support in a non-judgemental way to anyone who would find it helpful. It is not just for religious people. Our person-centred approach aims to offer anything from a listening ear and general support to appropriate religious prayers and services. There is the facility for your prayers, prayer intentions or thoughts to be left. 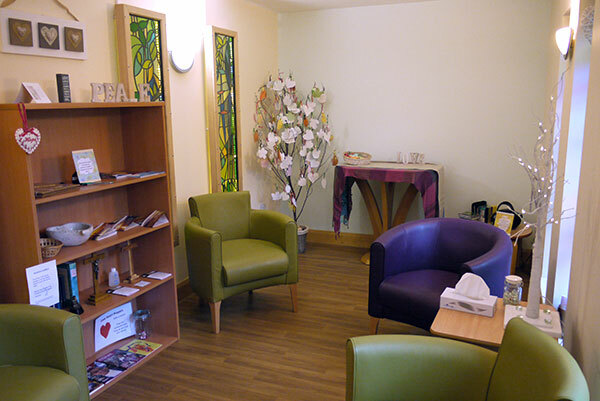 The Pastoral Support Worker reads and offers prayers about these as part of the regular prayer time in the Hospice. All human beings have a spiritual aspect which enables us to live life with meaning and purpose. It is about living life in the present moment, in loving relationships with self, others, and something beyond, giving a sense of belonging, a connectedness. When faced with challenging times, exploring your spirituality may help you to search for a source of hope and strength. We can be alongside you, where feelings, fears and hopes can be acknowledged, expressed and safely explored. You may also want to consider and explore questions of faith. We aim to provide a safe environment to enable you to explore and express your feelings, or just to be still amidst all that may be happening to you or your loved one. We can also offer more practical support from within the Family Support Team or external to Woodlands. Religious support is available from within the team and also the Aintree Hospital Chaplaincy Team. Support can be accessed for people of all faiths, or no faith.